Virtualization has gone way past the point of pilot projects and limited scope implementations. Virtualization is driving cloud migration. The moment has arrived to focus on a thorough, optimal approach to virtualization. 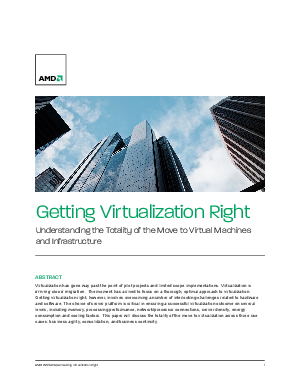 Getting virtualization right, however, involves overcoming a number of interlocking challenges related to hardware and software. The choice of server platform is critical in ensuring a successful virtualization outcome on several levels, including memory, processing performance, network/processor connections, server density, energy consumption and cooling factors. This paper will discuss the totality of the move to virtualization across three use cases: business agility, consolidation, and business continuity.